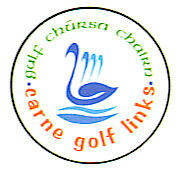 Carne Golf Links was the last links course designed by the the late Eddie Hackett and is now believed by many who have played there to be his greatest challenge.
" Carne lies in the splendid sand dunes overlooking Blacksod Bay, Inishglora, Inishkea and Achill Islands. Affording little disturbance to the natural and unspoilt environment that surrounds it, Carne is "everything you could ever ask for from the first tee to the eighteenth green".